Fever - speeds up bodily elimination of toxic waste. No Appetite - when a fever is present, the digestive system shuts down thus removing the need and desire for food. Vomiting/Diarrhoea - the body's way of eliminating undigested foodstuff from the digestive tract. Tiredness/Lethargy - the body's way of forcing a sick person to rest thus conserving its energy for the vital tasks of cleansing and repair. Glandular Swelling - the lymph glands filter the blood for toxic substances. Swelling of these glands greatly increases their filtering capacity. Skin Rash - represents an elimination of toxic waste, the skin being a major eliminative organ. Mucus Elimination - also an elimination of toxic waste. Mucus is made up of the body's white blood cells which are the body's garbage cans containing toxic residue. A good example is the runny nose. Inflammation - serves the same purpose as fever, to cleanse and repair damaged or poisoned tissue in the body. 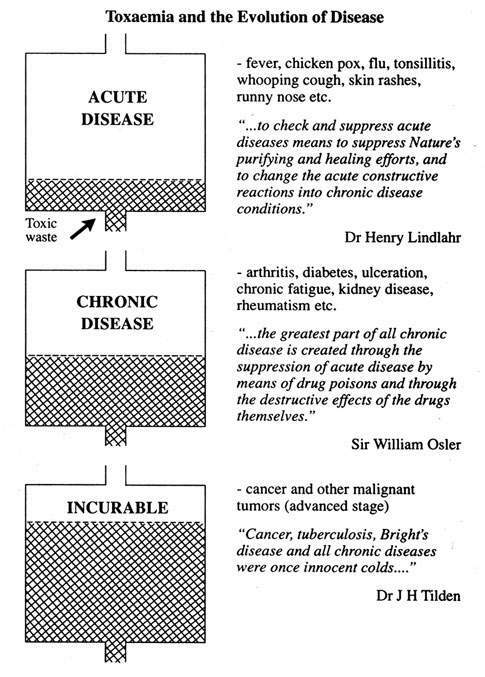 "Diseases are crises of purification, of toxic elimination. Symptoms are the natural defences of the body. We call them diseases, but in fact they are the cure of diseases." By clearly understanding the true purpose of symptoms, the beneficial nature of childhood infections becomes readily apparent. These so-called infections serve to restore internal purity thereby promoting the health of the child. 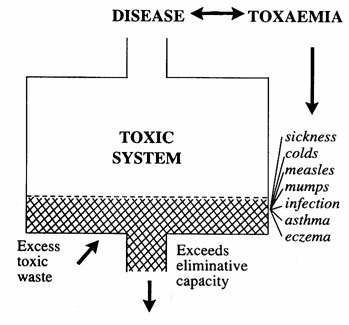 This will explain why natural health practitioners make no attempt to suppress these symptoms, instead they believe that the symptoms should be allowed to run their course so that complete detoxification is achieved. On the other hand, should these symptoms be suppressed by medical drugs or other suppressive measures, then the body will be forced to retain within its own tissues the poisonous wastes that it is striving to remove. This can not only result in increased suffering and complications, but it can lay the foundations for chronic disease in later life. If you know of a child who has ever suffered complications or died from a childhood infection, then find out how the child was treated, for in the opinion of many doctors, it is incorrect treatment including suppressive drug therapy that lies behind most complications and fatalities. In many cases poor underlying health is also a factor. "It should always be borne in mind when thinking of complications, that they too often wait, not upon the original disease, but upon the treatment of it." Chicken Pox - Why do children die?